Even in a challenging environment we did not stop investing. Our commitment to long-term business sustainability underpins our growth strategy. 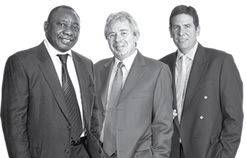 Net capital expenditure of R2,7 billion, is 21,4% up (2009: R2,3 billion). We invested R1,6 billion in capacity expansion and we continue to demonstrate our confidence in the future through major, long-term investments to ensure medium-term growth and sustainability; for example, the R503 million spent by our freight business on upgrading and expanding facilities. Continuing focus on internal expansion is complemented by awareness of outside opportunities. Early in the period, the €250 million Nowaco group acquisition demonstrated that our ability to conclude major acquisitions is undiminished. We carried through the deal in the face of strong opposition from private equity groups, an indication that we retain considerable "fire power". Major contributions came from our foodservice businesses, though the respective contributions from each business reflect changes in national markets and different rates of business growth. Our Australian foodservice business now accounts for 10,3% of Group revenue. New accounting requirements in terms of IFRS 3 in the treatment of acquisition costs largely nullified the headline earnings contribution from our new eastern European foodservice business. Results from our retail automotive business are much improved yet still way below previous levels achieved. However, much of the new vehicle sales activity is attributable to the fleet and corporate business segments. The vehicle market for retail consumers remains subdued as credit approval rates remain low. In Freight, commodity exports improved while demand for outsourced services increased. Businesses in the printing and related products sector faced strong challenges, but performed well. The major area of underperformance is in the Industrial and Commercial division. Voltex, historically a major contributor, has been hit by a major decline in volumes as construction work dried up and the demand for copper-related products fell. Simultaneously, cutbacks in the corporate office market had significant impact on the furniture businesses. Revenue fell 2,3% to R109,8 billion (2009: R112,4 billion), impacted by lower import revenue in Safcor Panalpina, price deflation and the impact of the appreciating rand. Deflation was evident in all geographies as lower demand drove product prices down. Many operations achieved market-share gains as they traded aggressively and took advantage of market weakness. Operating expenses were well controlled across the Group, reflecting a decline on the prior year. The trading margin improved to 5,1% (2009: 4,6%). Headline earnings were impacted by abnormal charges of R61,2 million relating to acquisition costs, mostly attributable to our new eastern European businesses. Previously, these once-off acquisition costs would have been capitalised to the cost of the investment, but under the revised IFRS 3 accounting standard are now included as an expense in headline earnings, impacting headline earnings per share negatively by 2,1%. Our balance sheet remains strong and appropriately capitalised. Net debt declined assisted by a R0,7 billion reduction in working capital and despite additional debt funding of R1,7 billion for the Nowaco group acquisition. Bidvest normally absorbs working capital in the first half of the financial year and releases working capital in the second half. This year, seasonality showed a key shift. The depth of the recession in the first half was one factor as we acted promptly to cut our cloth according to lower activity levels in key areas. The effect of cost-cutting measures came through early on. On the flip side was the hosting of the 2010 FIFA World Cup™ in June and July. Some businesses, notably in foodservices, stocked up ahead of the event. Interest cover improved to 7,4 times from 5,0 times in 2009, reflecting significant borrowing capacity. Net debt to equity at 23,1% shows pleasing improvement (2009: 29,2%). Net finance charges declined 26,3% to R758,5 million. We benefited from a prompt response to increased credit risk. This was already a focus area as the year began. We took an aggressive view, applied strict credit extension criteria and gave focused attention to debtors collections throughout the year. We lost some business as a result of this cautious approach, but as the year progressed we experienced relatively few bad debt problems. Such action will undoubtedly benefit the businesses as markets return to some form of growth. Return on funds employed showed pleasing improvement, rising from 36,4% to 38,7%.